Congress on Wednesday hit out at the government, saying it was a “glaring diplomatic failure” on its part and alleged that Prime Minister Narendra Modi has reduced foreign policy to “photo opportunities without any tangible results”. 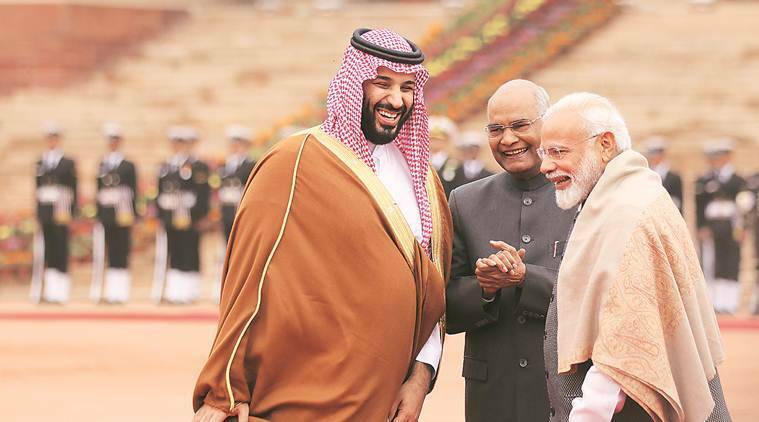 With Saudi Arabia’s Crown Prince Mohammed bin Salman making no mention of cross-border terrorism emanating from Pakistan or the Pulwama terror attack during his India visit, the Congress on Wednesday hit out at the government, saying it was a “glaring diplomatic failure” on its part and alleged that Prime Minister Narendra Modi has reduced foreign policy to “photo opportunities without any tangible results”. The main opposition party also hit out at the Prime Minister for breaking protocol and receiving the Crown Prince at the airport. “The Prime Minister should not be seen as competing or equating himself in his conduct with the Pakistan Prime Minister. But he seems to be eager to compete with and emulate Imran Khan in breaking protocol and receiving the Saudi Crown Prince at the airport without any need or justification,” senior Congress leader Anand Sharma said. In fact, the Prime Minister, he said, should have conveyed India’s outrage and concerns over terror emanating from Pakistani soil and enlisted Saudi Arabia’s support to the naming and banning of Jaish-e-Mohammad as a terrorist organisation. “While we value the relationship between India and Saudi Arabia, it was equally important that at this critical juncture, when the entire country is deeply outraged after the Pulwama attack and when the Saudi Prince had just been to Pakistan on an official visit, the Prime Minister should have conveyed India’s outrage and concerns and enlist Saudi support to the naming and banning of Jaish-e-Mohammad as a terrorist organisation,” he said. “But the fact that the Crown Prince has visited Pakistan after the Pulwama attack and refused to endorse the ban on Masood Azhar and the declaration of Jaish-e-Mohammed as a terrorist organisation seems to have been lost on the Prime Minister,” Sharma said, adding that the Prime Minister has to answer for the “cavalier” conduct of India’s foreign policy and for “reducing diplomacy to photo opportunities without any tangible results”. “This is a diplomatic failure. The Prime Minister must understand that diplomacy cannot be reduced to a photo opportunity or an embrace,” Sharma said. The Congress also asked whether according a grand welcome to “those who praised” Pakistan’s “anti-terror efforts” was the Prime Minister’s way of remembering those killed in the attack.